I bought a new Harley-Davidson motorcycle yesterday. How crazy is that? At my age. Yet I actually fit the Harley demographic perfectly. I’m in my early 60s, have a decent income, and sport a few inherited rebellious genes. But that’s the purported problem. I may not buy another new Harley if this one has the longevity I expect. Harley wishes my son and his cohorts would buy a Harley. But millennials don’t seem to be buying this type of bike. Maybe it’s because of the brand image. In the world of product marketing, Harley was ranked #77 on the Interbrand list of the world’s best brands. 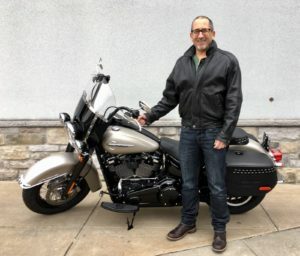 While, yes, Harelys are favored by gang-type people or wannabes, most Harley owners are normal people who like the style of motorcycle Harley makes. I know many men and women who love their Harleys and not one of them would knowingly ride into the same zip code as a bar fight. I know I wouldn’t. They are business owners, federal bureaucrats, millionaires, middle management employees, retirees, and naturalized Americans who love American culture. Among motorcyclists, the company seems to inspire either lifelong devotion or irrational hatred. Ever hear a Ford F-150 devotee spit about Chevy Silverado and the morons who own them, or vice versa? I bought a Harley partly for the emotional appeal and partly because I did a lot of research before buying. My cousin Danny, who’s older than me and has ridden practically since emerging from diapers, has a theory that deep down, everyone really wants a Harley. Me and my new Harley. Note the studded suggestion of yesteryear. The word “motorcycle” is analogous to “automobile” in that it covers an astonishing array of styles and purposes. Just as cars come in sport, sedan, SUV and a million other variants, motorcycles come in dirt, motocross, standard, adventure, naked, sport, dual sport, cruiser, bagger, touring, and sport touring. Each has many variants. That’s not counting the many variants of scooters and three-wheelers. Engines might be V-6s, inline fours, inline 6s, thumpers, parallel twins, opposed twins, V-twins. My new bike is, to my mind, a beautiful machine and a nicely engineered one. I like metal things. I like engines that make a lot of noise. My new engine has roughly the same displacement as my VW’s. Yes, it carries a badge associated in some people’s minds with motorcycle gangs. My answer to that is, organized criminals drive Cadillacs, Audis and Lexuses. Does that mean you shouldn’t own one? Sales at the company fell last year and management is telling investors to expect still lower unit sales in 2018. The motorcycle industry itself is in something of a downturn. One theory is that millennials aren’t getting into the sport at all. Harleys do carry something of a premium price. But I’ll tell you this. Their dealers — in this case, Old Glory Harley-Davidson in Laurel, Maryland — treat you like royalty. It took three, strangely enjoyable hours in the store to complete the transaction. They feature an elaborate espresso machine, even offered me pizza. They take you around to parts, service, finance, and clothing and accessories to meet the people. When a sale is done, the customer rings a big brass bell in the showroom, and everyone stops and applauds. They give you your first Harley T-shirt, albeit with the dealer’s name on the back. The owner of the dealer came out of his office to say hello and thank me. During an elaborate “walkaround” of your new vehicle, the service person placed the owner’s manual on her palms, and stretched her arms toward me, saying, “May I hand this to you?” No slouch, this middle-aged lady puts 25,000 miles a year on a big touring bike herself. After they install the few accessories I ordered, they will deliver the motorcycle to my house in a trailer … a Harley-Davidson logo’d trailer. When’s the last time you had a retail experience like that? Plus, the sales people know their products down to the bolt (SAE, not metric for what they call American Iron). When I’d visited a couple of motorcycle shows and dealers of Japanese bikes, no one knew whether the model I was interested in was even being made any more. Great analogy, Tom. I’ve always thought that customer service is the holy grail of retail. It should be the key factor in any major purchase decision. You experienced it with your Harley dealership and, no doubt, those folks will benefit from this exposure. Some brands that come to mind when I reflect on a great customer experience are Cutco, Skagen, and Calphalon, to name just a few. Each of these companies are the best at making their products and their service after the sale something that demands my loyalty. It’s been fun to watch your journey, which started from being bitten by the biker bug and now continues in the culmination of the dream that we can never fully explain to non-riders. Put lots of miles on that Harley. Remember that it’s only two and a half years until the OFRBMKWHWLGGOBRB! See you in Miami in September 2020!